Humans have an eye for the familiar: for people, for civilizations, for planets and planetary systems that match what we have seen in the past. For this reason, as well as a few others, we rarely find something truly unique in the universe. When we do, it's often by happenstance. Finding a planet ten times the mass of Jupiter orbiting 40 times further out than Pluto was in some ways unexpected. "It's not a type of exoplanet we had previously found and it's certainly not one that the theorists were expecting," said paper co-author PhD student Marie-Eve Naud at the University of Montréal, "especially not around low-mass stars like GU Psc (~30% the mass of the Sun)." Last June, Astrobio.net ran the surprising story of a planet 5-10 times the mass of Jupiter that formed 80 AU from its parent star. In yet another twist in the continuing saga of planetary treasure-hunting, researchers in Naud's group at the University of Montréal announced the discovery of a planet many times the mass of Jupiter at an incredible distance from its star: 2000 AU. This planet-GU Psc b-is so far from its star that it could be photographed without the aid of adaptive optics, appearing as an independent point of infrared light from its star GU Psc. Unlike GU Psc b, most of the 1700 plus exoplanets in NASA's current catalog have not been directly imaged, or photographed directly, in any wavelength. Their gravitational effects on their parent stars have been measured. Sometimes the dimming effect as they occlude the light from their parent stars have been recorded. Occasionally, existence of planet is inferred by the presence of a gap in dust disks rotating around a star. At present, the Exoplanet catalog maintained by the Paris Observatory lists only 46 planets that have been directly imaged, of which GU Psc b is unique in a number of ways. 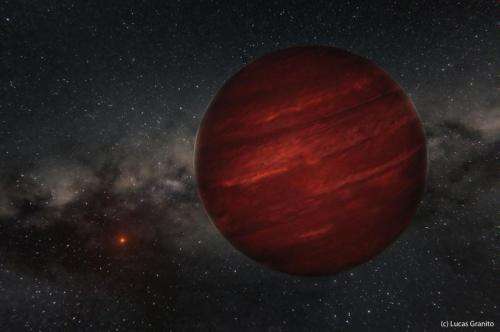 Of the exoplanets that have been photographed, GU Psc b at 9-13 times the mass of Jupiter is one the largest that is probably not a failed star, or brown dwarf. At thirteen times the mass of Jupiter, a gas giant attains the minimum mass to begin some nuclear fusion early in its life. Many of the photographed companions might in fact have a mass greater than 13 times that of Jupiter, and may be more like brown dwarfs than planets in nature. GU Psc b is also one of the few so far out from its companion. Perhaps most interestingly, of all the far-out planets discovered so far by any means, this new planet is only giant, distant one at all that rotates around a star like our own. "GU Psc b is certainly the farthest planetary-mass companion known around a regular, main-sequence star," said Naud. In their recent paper, Naud and her co-advisor at the University of Montreal Dr. Étienne Artigau describe how they applied an old technique in a new way. Seeing giant planets that are relatively close to their stars, many light years away, requires state-of-the art adaptive optics (AO) and the Gemini Observatory. Naud and Artigau had the idea of looking for farther out planets using a "standard" camera. To find distant planets without specialized instruments, they exploited certain color, or wavelengths, that distinguish planets from stars or galaxies in the background. They surveyed dozens of stars with this technique before finding GU Psc b. "My idea with this project was to explore the entire 'sphere' where a planet could physically stay for an astrophysically significant amount of time," said Artigau, "regardless of predictions relative to formation mechanisms." 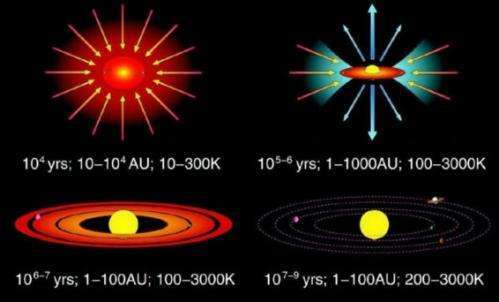 Many models predict that planets should not be found beyond 100 AU. Those same models also predict that if planets are present within about 5000 AU of a parent star, they should stay there for billions of years. For astronomers, that means there is a wide swath of sky that can potentially contain a planet. Regardless, many recent searches have focused on finding planets very near young stars. Naud and her colleagues took a slightly broader view. instruments, but it allowed us to detect GU Psc b, located 42 arc seconds from its star," said Naud, "GU Psc b is precious to validate our models of similar objects, and we will be able to use the information we obtain on this object to better understand other, closer-in and harder to study planetary-mass companions. Because GU Psc b is so far from its parent star, astronomers can learn a tremendous amount about it. In just one hour on the Gemini North scope, Naud and her team obtained a spectrum of GU Psc b that allowed them to estimate important physical properties of the planet, like mass and temperature. 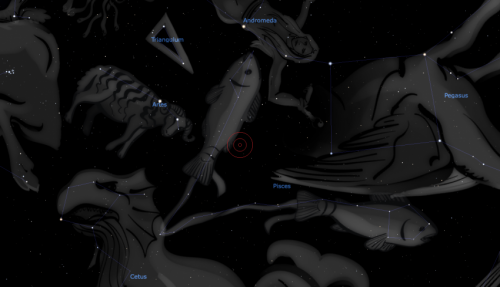 These are usually difficult or impossible to observe because of the nearby star. As a very distant companion, GU Psc b is a diamond in the rough. Not only does it provide us a very clear view of the planet itself with its mass and temperature, but it also provides us with an impetus to look for more planets like it, in places we would have never looked before. "This type of object exists, and we can quite easily find them," said Naud, "so we should definitely search for them." I would like to see the day when we have technology to take a real photo of an exoplanet in all its glory, with distinguishable features and not just a point of light. This could be a good candidate for that day. javjav: The point or rather, spread of points on a CCD, has been used to thermally map planets longitudinally though, as they rotate in front of our telescopes. But yes, more resolution. IIRC the limit for an Earth orbit wide observation (perhaps somehow patching a year's observations together interferometrically somehow) for a nearby planet would be around 20 meters, or catching large elephants moving (well, blue whales) and large trees grow up over the years. As it is so easy to observe, maybe they should try for some moons. More than a planet, quite a failed brown dwarf isn'it? That should maybe give an explanation. Not formed from the star protoplanetary disk but a failed star formed from the same cloud than the star and then attracted into its orbit? Who knows? Anyway new data is always welcome.